Well if you did and if you, like I, tried to be efficient and contact the Child Benefit Charge call centre to register the fact that you no longer qualified, you may just be a tiny bit irritated? Or maybe, as in my case, you may even be angry … or possibly you may have had to swallow a huge amount of call centre nonsense rage? Of course it is no fault of the unfortunate employees at the end of the line. In fact, after 6 minutes of getting through the system times two (due to getting cut off first time) I was so fed up, that I was unbelievably calm and polite. Of course, I know what it is like to work on a telephone help desk. My Glaswegian operator was lovely, really sweet, professional and polite. The only little indication I gave her that I was upset about the whole palaver was when her script suggested she ask “… and would you like to cancel your child benefit now?” or something along those lines. 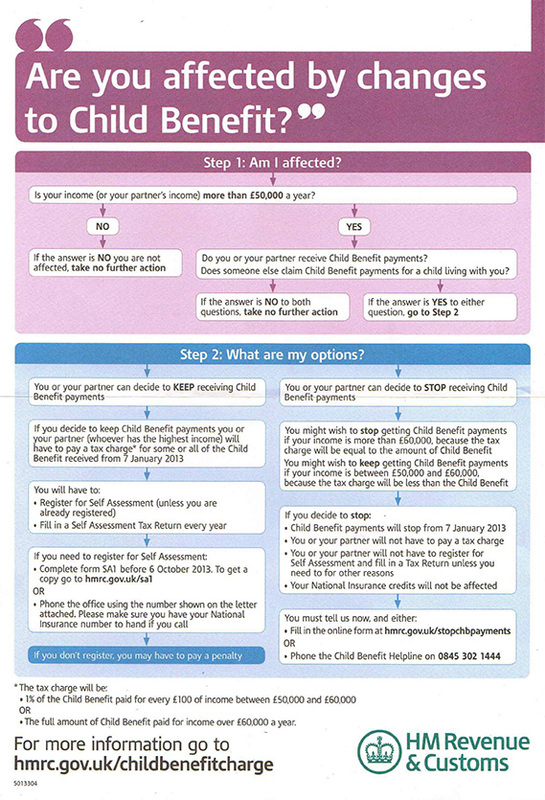 Well, as any of you who are in the same situation as I am will know: NONE OF US WANT TO CANCEL OUR CHILD BENEFIT, but we have been told that we are having it taken away, come what may, on 7th January 2013. To add insult to injury we must call a 0845 number, sit in a queue, listen to several minutes of recorded messages, sit in another queue, press numerous digits on our phone before eventually being asked if we want to have our benefit cancelled! I tried to be extra sympathetic and empathise with her obviously rather difficult job. “Well, actually, NO I DON’T WANT TO CANCEL MY CHILD BENEFIT. But our lovely prime minister, who vouched for supporting the “squeezed, hardworking, middle” parents, is now not only removing my child benefit but, to really add insult to injury, making me sit in a flipping call centre queue to make sure this happens. Fine Mr Cameron and Mr Osborne – we get it. Times are tricky and the government coffers are even emptier than you predicted prior to getting elected two and a half years ago, so you need to get tough. We have already suffered rising indirect taxes, higher VAT, university fees, fuel bills, etc. You need to be real men, draw the line somewhere? It’s not easy running a country is it? Well let me tell you, it’s not easy running a family household either and whilst I agree with attempting to redress the inequality of incomes for families across the country, you really have a strange way of doing things. Of course, you have only taken this benefit away from higher earners and I accept those on lower incomes are really struggling, but why the single salary cap? Why not base the removal of the benefit on joint salaries – would that not make more sense? 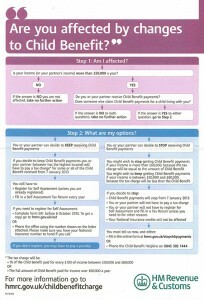 If two individuals both earn £59k they get to keep the vast proportion of their child benefit. But a single parent earning £60k loses the lot? Don’t stay at home parents deserve as much as working ones? They are hardly trying to rip off the state by putting all their energy into bringing up their family to the best of their abilities. And what about single working parents or widows, divorcees with no maintenance, parents with partners who can’t get a damn job? Am I missing something, or is this a really mad system? Let’s look at the justice of the whole business. I admit that I earn slightly over £60,000 per annum. I am also bringing up two children on this single salary and they happen to be teenage boys with feet that grow every 5 minutes. I accept I am very lucky, I have a great job and own a growing company which thank God (and 20 years of very hard work) is financially secure. But I also have a lot of responsibility and whilst I could pay myself more I have in fact given myself a pay freeze for the past two years. Times are tight for all of us and particularly difficult for some of my team who don’t have a director level salary. But I also pay a great deal of tax and I have never tried to avoid it, move the company off shore or shirk any fiscal responsibilities, so do I deserve to be penalised? Child benefit is (or was) a leveller. For a democratic country it was a way of making sure women (since it is generally paid to the mother), have a small income which is guaranteed no matter what. It is a last resort source of finance. I really appreciated it and in the early years of JoJo, when the business was a start-up and some months I really could not afford to pay myself, then the Child Benefit was a lifesaver. Having Child Benefit taken away in this cack handed manner is an abomination. No matter how much time Mr Cameron spends talking to Justine Roberts of Mumsnet next election, he can never make up for this latest sabotage of Great British fair society. I’m sure I am not the only parent ranting about this issue … but I cannot see how it could possibly have been worse handled. HM Revenue and Customs knows exactly who falls into the below or above £60k per single salary threshold, so why on earth do they insult us by making us sit in a telephone queue to face the benefits executioner head on or run the gauntlet of “If you don’t register, you may have to pay a penalty”. Do your research Mr Chancellor and if you intend to tax me more or take away the only benefit this country has ever given me, PLEASE don’t make me sit in a telephone queue after a long day at work when my children are hungry and needing their supper! Thank you for so eloquently presenting the facts. We’ve just gone through the same ‘joyful’ experience as a great start to the last day of the new year. It’s insulting and demeaning and makes my wife feel awful. I earn slightly more than the upper limit and support my wife and 2 young kids as she looks after them. The last thing we need is her feeling even more guilty for focussing on the children for the next few years. I would almost be able to take it if there wasn’t this glaring inconsistency regarding two income couples. I already lose my wife’s tax allowance but I feel genuinely robbed after this. I was always warned not to vote Tory by my parents but I didn’t expect they would do this to the country!! Happy days…….